Summer in a bite, these orange creamsicle pie bars are packed with orange flavor from freshly squeezed orange juice and grated orange rind! 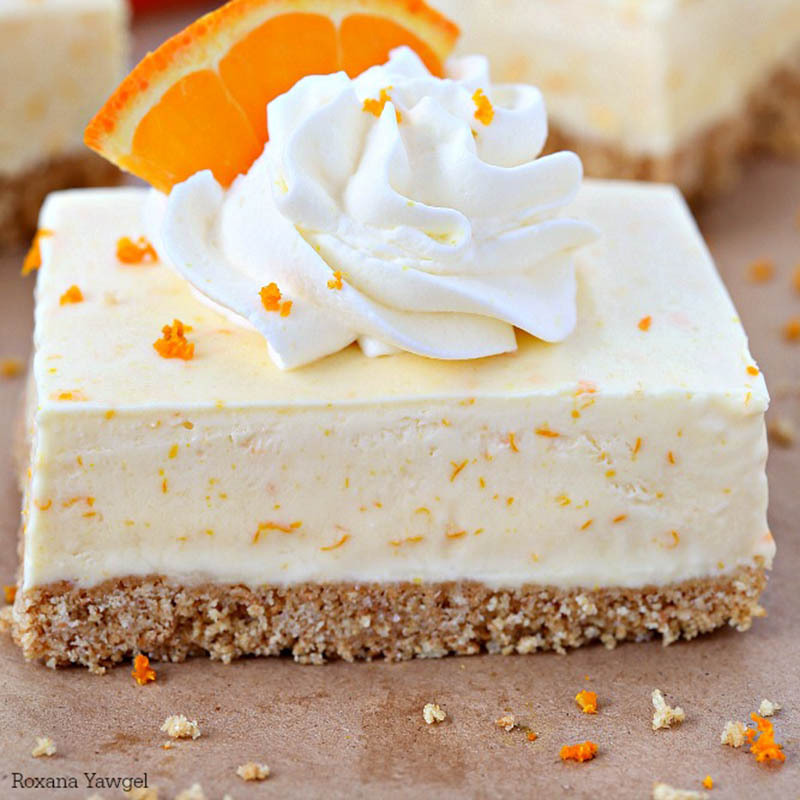 Forget the orange flavored jello, these orange creamsicle pie bars taste so much better! Summer in a bite, these Orange Creamsicle Bars are packed with orange flavor from freshly squeezed orange juice and grated orange rind. In a food processor, add graham crackers, butter and 2 tablespoons of sugar. Pulse for 1 minute or until cracker crumbs stick together to form pea size crumbs. Press mixture onto bottom of 13X9” baking pan. Pack and press it well otherwise it will fall apart. Place baking pan in freezer while making filling. In a food processor, add cream cheese, condensed milk and sugar. Pulse a few times until mixture is creamy. Stir in orange juice, grated rind and orange extract (optional). Pulse 2-3 times until just combined. Stop and set aside. In a cold mixing bowl add heavy whipping cream. Use whisk attachment to whip cream gently, adding powdered sugar gradually. Whip until firm peaks form. Use spatula to gently fold whipped cream into orange mixture, slowly rotating the bowl clockwise as you fold in whipped cream. Do not over mix! Remove crust from freezer and pour filling over crust. Return to freezer and chill for 3 – 4 hours. Just before serving, cut into bars. For clean cuts, wash knife in warm water after each cut. Top with creme chantilly and sprinkle grated orange rind, if desired.